Anunoby (16 games): 11.1 points, 5.4 rebounds, 1.4 assists, 1.3 steals, 1.3 blocks, 61.5% eFG, 56.3% FT, 31.1% 3PFG in 25.1 minutes per game. OG Anunoby entered his sophomore season with enormous expectations. After his role grew from fringe rotation player to a key sub in IU’s turnaround in 2015-16 that included a Big Ten title and a run to the Sweet Sixteen, Anunoby was viewed as a potential All-American. His defense in IU’s NCAA tournament round of 32 win over Kentucky was a game-changer. He blocked a pair of 3-point attempts by Jamal Murray at crucial times to help the Hoosiers prevail over the Wildcats. His measurements are perfect for a forward – 6-foot-8 and 235 pounds with a 7-foot-6 wingspan. He displayed a shooting touch as a freshman (44.8 percent on 3s) that suggested he was capable of a big leap forward offensively as a sophomore with a larger role. But a season ending knee injury suffered in IU’s 78-75 win over Penn State on Jan. 18 cut Anunoby’s final season in Bloomington short. Prior to his injury, Anunoby’s sophomore campaign had its share of ups and downs, much like Indiana’s season. 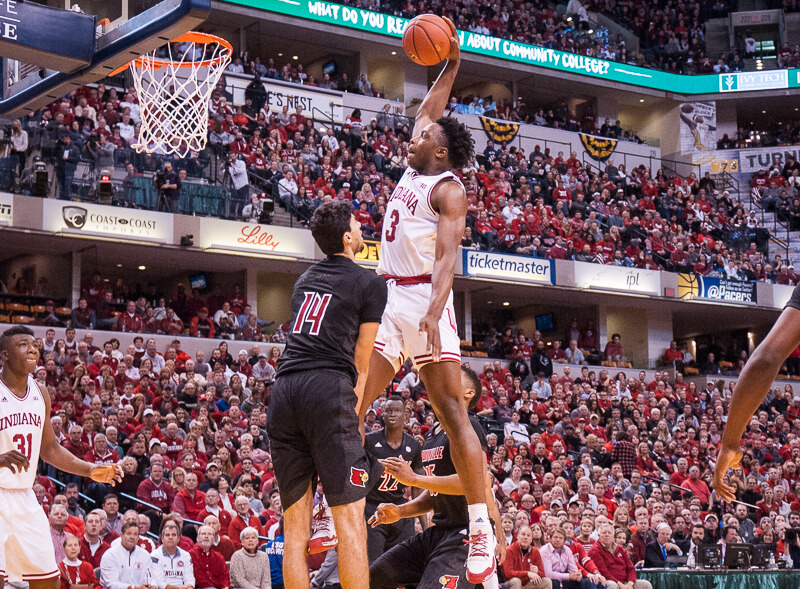 Anunoby looked terrific in early season scrimmages and IU’s two exhibition games. He outplayed Josh Jackson in IU’s season opening win over Kansas in Hawaii. He had 16 points in IU’s win over North Carolina in late November and looked like a potential All-American. But as you might expect from a player short on experience, there were moments where Anunoby showed that his game was still very much a work in progress. His 3-point shooting percentage dipped to the low 30s. His free throw percentage improved from his freshman season, but was still well below average at 56.2 percent. In IU’s 3-game losing streak to Nebraska, Louisville and Wisconsin, he had 10 turnovers in three games. Word leaked on Monday that Anunoby’s intention is to enter the 2017 NBA draft and hire an agent, which means his Indiana career will end before it was able to hit full stride. Several mock drafts still list him as a potential late lottery pick and nearly every projection has him going in the first round. Despite his injury, Anunoby is the definition of a “3-and-D” forward in today’s NBA and a team will be willing to bet on his upside. It’s a bet that could pay off in a major way as Anunoby hasn’t even begun to scratch the surface on his long term potential. Bottom Line: Assuming he makes a complete recovery, which is the expectation, Anunoby’s best basketball is ahead of him. He doesn’t project as a star offensively, but he’s good enough in spot-up situations, in transition and as a straight line driver to be effective. Defensively, his versatility will make him a valuable asset in the NBA as he’s able to comfortably guard three or four different positions. As far as his IU legacy goes, he’ll be fondly remembered as a player who exhibited a business-like approach and was an instrumental part of the program’s turnaround 2015-16 season. Quotable: “OG has a very strong faith and a courageous spirit. We are going to do everything as a basketball family to help him recover and rehabilitate from this unfortunate situation.” – Tom Crean after Anunoby’s season ending surgery was announced in late January. One of the all-time “what-ifs” of Indiana basketball history. Consider the stretch that included the last two games of 2015-16 — a win over Kentucky and a loss to the eventual national runner-up, games in which OG showed himself to be equal to the top talent in the country — and then the first 6 games of this year, which included wins over two eventual #1 seeds, including the national champion. Things looked awfully bright at that point. Sadly, OG hurt his knee at the end of the last game in that sequence, and was really never the same, and the team imploded for all kinds of reasons. The coach that assembled all that is gone, and OG is gone. The future looks very bright to me, but the sense that something got away from us will linger. Sad to see him go, but thrilled that we ever got to have him as a Hoosier in the first place. A shame that this year was such a disappointment in general; had he been healthy and the team around him had gelled just a bit more, who knows what they could have accomplished. Between the last two months of 2015/16 and the first of 2016/17, there may have been no better month for an individual IU player in recent memory. He’s going to make an NBA team very happy. May take a couple seasons, but I have no doubt he will impact games at both ends of the floor at the next level for a long time. Wish ya the best, OG! Really enjoyed watching OG play. Good luck. Hope my Jazz draft him. It is hard to know what is full potential is going to be. I couldn’t help but think that Crean’s system wasn’t the best for him offensively. He is a tall gifted athlete that can hit a 3 but like many other bigs on the team, we seemed to have them outside too often. OG could create an ESPN highlight and completely disappear in the same game. He certainly should take the money and opportunity but he will need to develop a lot to make it in the league and they have very little patience. OG is enjoying the quintessential “backup quarterback” popularity wave. I have no doubt of his talent and drive, but he’s still got that “best player you’ve never seen” thing going. Most of America has seen him only destroying ky last year and outplaying UNC and KS this year and think he’s had two whole seasons of consistent stellar performances. Again, not to knock him – I think those performances will prove to be indicative of his NBA career – but he is wise to grab the money now while he’s a superstar who’s never had a bad game in everyone’s imagination. Should also give credit where it’s due: This is a kid that virtually no one wanted and Crean saw his potential. Just like some NBA team is going to get a gem in OG, some college team is going to get a hell of a recruiter and talent evaluator in Crean. I believe Fran Mc was on both OG and JM. Let’s not pretend he didn’t have any other D1 offers. And TC won’t be recruiting to an Indiana any more. It will be a little tougher. Gonna miss him on the team, hope Clifton Moore and J. Smith stick with us! He was also offered by GA and Iowa as well as George Mason. So he wasn’t virtually unwanted. I believe you but I don’t think that is correct. One of the Iowa games their freshman year, the commentators were discussing than Fran thought he had one or both locked down before IU came in. I’m familiar with how Fran operates, so he may not make two dozen offers for three spots. Or it could have been idle chatter by the commentators. Realistically, OG was ranked 280th by 247sports. 247 had him 56th at his position (ESPN 41st). There are 347 D1 schools * 13 scholarships / 4 years = roughly 1128 freshman scholarships each year. He was definitely playing at least mid major, but IU may (or may not) have been his only Power conference opportunity. The fact remains that he was a great get. Justin Smith never asked out of his letter of intent. I totally agree with your statement. OG was the poster child for Indiana basketball under Crean. He could be a highlight on ESPN while dunking over someone and then completely disappear from the game. Assuming he recovers fully from his injury, his challenges will not be physical but mental. Can he go out and compete every night. Does he want the ball, want the challenge of playing against the best. We never got to see whether he could do that at IU. I hope he has fun and is a great success but could also seem him fade into the background. Still, he needs to try and take the $$ now. My original point stands: no one expected him to be as good as he turned out. Point in case: the last time I listened to Dakich’s radio show was right after Crean had signed OG. Dakich was ragging on Crean’s recruiting and yelling about how OG was a wasted scholarship and then proceeded to spend time making fun of his name. I know Dakich is a special kind of idiot, but his thinking was not unusual. The farther he falls down the first round the better it will be for him. Going to a team like the Warriors, Spurs, Cavs, (or Celtics though not as good a fit) whre he could sit and develop for a year or two would turn him into a pros pro quickly. Selfishly I hoping either OG or Harry Giles get picked by my Jazz. Jazz fan?? I don’t believe I’ve ever met one before. Lol! Good health and good luck to OG. Alas..we barely knew ye! Curious to hear who some of the other “what-ifs” you’d include on that list. Would it include 1-and-dones? Just cut short by injury? Transfers? Players who got “Creaned”? That would be an interesting list to compile. 1. What if Larry Bird had stayed? 2. What if Scott May hadn’t broken his arm? 3. What if Eric Montross had come here? 4. What if Alan Henderson hadn’t hurt his knee? 5. What if Landon Turner hadn’t gotten hurt, and Isiah hadn’t gone “hardship” at a time when that was still rare? The answer to those questions in the aggregate is likely multiple national championships. I think it is lost at this point how close Bob Knight came to stringing together a Wooden-like streak of titles. What would you add/subtract from that list? I know this isn’t going to be popular, but OG provided us with some nice highlights and nice defensive moments in his 1.5 years. However, he didn’t have anywhere near the impact most people on this site thought he would have and honestly it was trending that way before he got hurt. I remember last year people wishing OG would get more of Troy’s minutes, but if we are honest with ourselves Troy was a better player for IU than OG was. Troy was a victim of trying to force the issue a lot of times when our offense came to a stand still and he had some foolish turnovers because of it. Troy did look natural though handling the ball. OG struggled dribbling and looked awkward and uncomfortable doing it. OG could be a solid defensive player in the NBA, but I just don’t see him developing enough of an offensive game to ever be a consistent player in the NBA. So I feel bad for the NBA team that uses a first round pick on him because drafting players like OG is what gets GMs fired. I know exactly what you mean, and don’t disagree as much as you might guess. He had some truly awesome stretches during the second half of his freshman year, and if had continued on that arc, he could have become a dominant player. As you say, though, that never quite materialized. It looked to me like he was pressing early in the year, as though he hadn’t quite gotten settled into a more prominent role. And of course he got sick, and then hurt, and then hurt again. So how much of what didn’t happen was due to illness and injury and how much was due to his limits as a player we’ll never know. But at his best he was capable of altering whole games, and he was part of the reason our defense improved so much over the course of his freshman year that we won the B1G. Like you I am not sure about him as a pro, but I sure would like to have seen him at full strength for the entire year last year. Not to knock the story, which as usual was great, but it always surprises me how little attention is paid to OG’s ankle injury in the UNC game. He was absolutely showing what we expected from him in the KU and UNC games, and then it was the ankle that first derailed his season. He was _just_ getting back to 100% the game before PSU, when he blew out his knee. We only saw a 100% healthy OG for the first four out of five games (he was sick against IPFW), and then maybe a game-and-a-half after the ankle injury. I can’t think of a player who will remain such an unfortunate question mark in terms of what he could have accomplished at IU. I have often times played in my head how Larry coming to IU would have played out along with Scott May not breaking his arm. I think it is more probable than not that IU wins the NC in ’75, ’76, ’77 and ’78. They don’t necessarily win in ’79 because Bird really would have come in the 74-75 season and not played as a Freshman, but they still would have won if May had not broke his wrist. Then he would have been gone before the ’79 season. The big question is what would have happened in ’79 and ’80 before they won again in ’81. They did win the NIT in ’79 and went to the sweet sixteen in ’80 though. I had never thought about Landon’s accident and what would have happened if Isiah Thomas had stayed for four years. Maybe you tack ’82 and ’83 on the end as more championships. 7 out of 9 ain’t bad and who knows what other recruits come in ’79 and ’80 if IU was winning everything four years straight. Maybe enough to go 9 straight years as NCAA Champs. Highly unlikely, of course, but by no means impossible. I think it is conservative to say that flip the outcome of the scenarios I described, and Bob Knight has an additional 4 titles. What about Maurice Creek injury his knee twice. He would of been a senior with hulls and watford. I love that there is no right or wrong answer here. A nice looking top 5 for sure. I’d definitely include Bird at #1. The only one that could possibly be disputed would be Montross since he never actually committed to IU. We could probably go all day on recruits who committed elsewhere. As for a recruit who actually committed to play for the Hoosiers… What if Josh Smith actually came to Bloomington instead of going to the league out of HS. Say what you will about his NBA career, no doubt he would’ve been a force in college. Not to mention the dynamic backcourt duo of Errek Suhr and Adam Ahlfeld! That’s a ton of offense! Though the chemistry under Davis probably would’ve been laughable. That team lost in the 1st round of the NIT that year, so that’s a big jump lol. Another that comes to mind is “what-if” Coverdale didn’t sprain his ankle before the ’02 title game? All those strengths of his still need developing and watching from the bench is not the way to develop them. I suspect he knows that as well but $1m a year has a say in the matter. I remember watching a bunch of retired NBA superstars talk about the best moments in their careers. To a man each brought up his college experiences, and not highlight reel stuff- just being with the guys, making a contribution, etc.